This image by NASA's Mars Reconnaissance Orbiter shows a field of sand dunes in Mars' southern highlands, just west of the Hellas impact basin. Giant "snakes" of sand slither across the Martian surface in a spectacular new photo by NASA's Mars Reconnaissance Orbiter (MRO). The image shows the middle part of a large, dark field of dunes west of Mars' 1,250-mile-wide (2,000 kilometers) Hellas impact basin, which is centered at about 40 degrees south latitude. "Here, the steep, sunlit side of the dune, called a slip face, indicates the downwind side of the dune and direction of its migration," NASA officials wrote in an image description on Thursday (March 23). 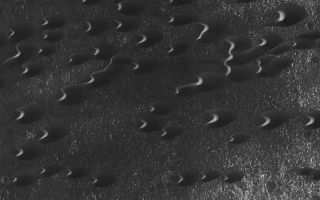 "Other long, narrow linear dunes known as 'seif' dunes are also here and in other locales to the east." The scale of the photo is about 10 inches (25 centimeters) per pixel, the officials added. Sand dunes are common on Mars, a cold and dry planet whose landscape has been shaped heavily by wind. And a fair number of the Red Planet's dune systems consist of dark sand, including the Bagnold Dunes, which NASA's Curiosity rover studied up close last year. The Bagnold Dunes lie inside the 96-mile-wide (154 km) Gale Crater, which is located about 5 degrees south of the Martian equator. That's far away from the dunes pictured in the newly released MRO photo, which the spacecraft captured with its powerful HiRISE (High Resolution Imaging Science Experiment) camera. The $720 million Mars Reconnaissance Orbiter mission launched in August 2005 and arrived at the Red Planet in March 2006. For the past 11 years, the spacecraft has been looking for (and finding) evidence of past water activity on the Martian surface, studying the planet's geology and climate, scouting out locations for future crewed and robotic missions, and serving as a vital communications link between NASA landers and rovers and their controllers back on Earth, among other tasks.